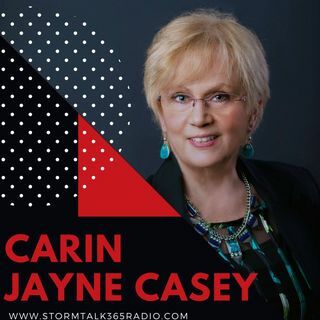 In “Turn to God with Carin,” Carin Jayne Casey shares a portion of her book, MY DEAR ROSA JEAN (sold at Amazon.com, Kindle, and Barnes & Noble Nook) each month. In this episode, she shares Chapters 5 & 6. Prior book segments can be found on YouTube or www.stormtalk365radio.com. Casey indicated that in Chapter 4, Rosa Jean (main character) had married Brad (abusive character) in a small wedding. In Chapter 5, what Rosa Jean refers to as her “Ugly Honeymoon” her new husband tried to ... See More kill her. She read the critical scene at pages 75 thru 77. This brought on her first experience in a woman’s shelter. Casey emphasized that forgiveness doesn’t mean going back to a toxic and dangerous environment, but unfortunately, many victims do go back once or more times before they escape. Once Rosa Jean forgave and went back, it appeared initially that Brad was making efforts with plans to take her and her children to Hawaii. But then he reveals his intent to use her credit for this trip, and she drops the plans. In her past, Rosa Jean had been taught that love includes sudden abuse, and people don’t always mean or do what they say. Casey believes it’s essential to promote other people’s healing by authentically sharing your own overcoming. She invited listeners to think about some questions, and welcomes feedback: Can you visualize yourself helping in this way? Why might women go back into an abusive home? How can hiding the truth of abuse harm unaware family? She believes knowing another’s past may help understand how they are, but we are each responsible for our own decisions and actions, and for rationalizing what we do. And, she notes it as trust warnings when one’s words don’t match their actions, referencing Galatians 5:25 and Proverbs 23:7.